File sharing and cloud storage solution - Securely Sync, store, access and share your important business files, with Dropbox Business, available from Wroffy. Over 150,000 companies around the world trust Dropbox Business Cloud Storage to securely sync and share their files. With a easy to use admin console to empower IT and simple sharing & collaboration tools to increase business productivity, Buy Dropbox for Business that enables teams to do their best work. Check out the Dropbox Business Features. Dropbox Business makes your work easy, with a central place to share & access files. Dropbox Business is a cloud-based powerful collaboration platform that allows employees to share & access their files anytime, anywhere. Dropbox is a cloud based central place for all your files where devices connected to your dropbox can easily access & share the files in it. You can also share specific folders with colleagues or customers. In practice you simply have an extra folder on your laptop or computer (like ‘My Docs’). What you put in this folder is shared to your personal devices. Any shared folders in your dropbox are shared instantly to the people you shared it with. Dropbox Business helps your organization grow without any limits, while you maintain complete control over company data and user activity. Choose from any from the three plans by Dropbox Business to meet your business needs. With Over 300,000 plus businesses already trust Dropbox Business to securely store, sync and share their important files. With a sophisticated admin console to empower IT and cloud collaboration tools to increase work productivity, Dropbox Business enables these business to do their best work. Buy Dropbox for Business – Wroffy Technologies is a Dropbox reseller in India & APAC. Over 150,000 companies around the world trust Dropbox Business Cloud Storage to securely sync and share their files. What is Dropbox Business ? Dropbox Business is a powerful cloud data storage & collaboration platform layered with robust admin console features that allows companies & enterprise to securely access and share files. Millions of business & users trust Dropbox Business to reliably collaborate, sync and store their important data so they can get work done. Over 200,000 plus businesses trust & buy Dropbox Business to securely sync store and share their files & folders. With a robust admin console feature to empower IT and simple collaboration tools to increase work productivity, Dropbox Business enables these business teams to do their best work. Dropbox Business gives end users the best environment & place to get work done and provides IT with the enterprise class security and admin control they require. Legacy file sharing solutions were designed & developed to keep internal data secure. Buy they don’t provide enough safety for sharing external and user mobility which can cause unexpected IT risk. With Dropbox Business, users can easily share internally and externally without compromising the security & ability to control and monitor the flow of data. Sharing controls, administrative console capabilities, and activity monitoring help minimize IT risk so that all of your teams can collaborate & work securely. Looking to buy Dropbox Business ? Wroffy is a Dropbox Partner in India offers Dropbox Business & Dropbox Enterprise at best pricing. Dropbox Business offers three different Dropbox Business Pricing models for business and enterprise for users to choose from with a free 30-day trial period to test out the Dropbox cloud storage features. When the free Dropbox Business trial period ends, users may choose from the following subscription packages: Dropbox Business Standard plan provides teams with 3 TB of cloud storage, and simple sharing and collaboration tools.Dropbox Business Advanced plan provides as much cloud storage space as your team needs in addition to sophisticated admin features, audit, app integrations and security features. Dropbox Enterprise plan provides a platform equipped with all of the core capabilities of Dropbox Business plans, plus advanced level security and control, enhanced customer support, and customization to meet your enterprise needs. If you are looking to buy Dropbox Business or Dropbox Enterprise plan for your organization, contact us. Wroffy is a Dropbox Reseller in India provides Dropbox Business subscription at discounted price. We also provide Volume discount for business, Non profit and education institutes. Dropbox Business: Standard (Annual) : Teams on business standard plan have an annual commitment and are billed annually for the plan. 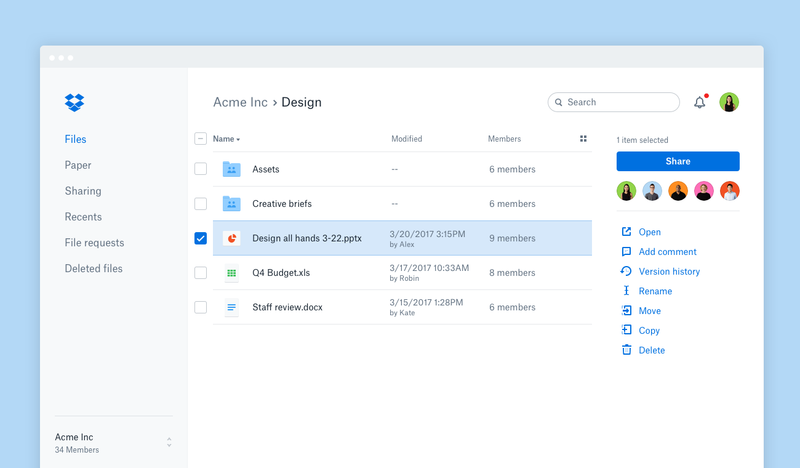 Dropbox Business Standard is built for business teams that need powerful cloud storage, sharing and collaboration tools with extra features that are not available on free Dropbox accounts. Teams on the Dropbox Business Standard plan get 3 TB of storage for the team, enhanced admin console controls to manage data, extended version history, and access to features like Smart Sync and Paper. Dropbox Business Advanced (Annual) : Teams on business Advanced have an annual commitment and are billed annually for the plan. Dropbox Business Advanced plan is built specifically for businesses that need more sophisticated IT admin console, audit, and integration features. Teams on the Business Advanced plan get as much cloud space as they need. Admins can enforce team invites, manage device approvals, and access to tiered admin options. Unlimited API calls for SIEM, DLP, IDM and DRM and 25,000 API calls/month with data transport partners extend the power of Dropbox Business with a vast variety of best-of-breed apps. Dropbox Business: Enterprise (Annual) : Business on Dropbox Enterprise plan have an annual commitment and are billed annually for the plan. Dropbox Business Enterprise is for enterprises that need custom, scalable solutions and individualized support. It has features that are specific to the Dropbox Enterprise plan, including advanced device controls such as network control, enterprise mobility management and account capture. Unlimited API calls for SIEM, DLP, IDM and DRM and 25,000 API calls/month with data transport partners extend the power of Dropbox Business with a vast variety of best-of-breed apps. Dropbox Business: Advanced Server Integration (Annual) : Teams on this plan have an annual commitment and are billed annually for the plan. The Server Integration option extends the Advanced plan by allowing teams to carry out complex data transport processes as they transfer data into Dropbox. It also shifts teams to a tiered storage model with generous quota levels designed for large-scale use cases. With this option teams still get unlimited API access and the ability to take advantage of features such as Smart Sync, Dropbox Paper, unlimited API calls, and powerful admin controls built for IT departments requiring more control like invite enforcement, domain verification, and device approvals. Dropbox Business: Enterprise Server Integration (Annual) : Teams on this plan have an annual commitment and are billed annually for the plan. The Enterprise Server Integration plan for Dropbox Business is for enterprises with custom solutions and support needs, planning a wide-scale migration of company data into Dropbox. The Enterprise Server Integration plan offers unlimited API calls a tiered storage model with generous quota levels designed for large-scale use cases. Teams also get access to comprehensive controls and customized support for organizations that require enterprise-level requirements. Smart Sync, Dropbox Paper and other advanced admin features are still available with this scalable option.